Cricket Media, online at shop.cricketmedia.com, is a magazine and digital company focused on dedicating a safe and secure learning network to children everywhere. Cricket Media offer 11 family-friendly magazines, as well as educational toys, books, and an application that allows children to read together with their loved ones when apart. Cricket Media is also America's most awarded publisher of children's magazines. Although Cricket Media is intended for children, it is also intended for educators, families, and partners. Want to give Cricket Media a try? Check out RetailSteal.com first for all the latest Cricket Media discounts, Cricket Media coupon codes, and Cricket Media promo codes. For a limited time only, enjoy 50% off all products plus free shipping with this coupon code from Cricket Media. Shop at Cricket media and save up to 60% on print and digital subscriptions. Click here to shop. Act now and enjoy a 40% discount with this coupon code from Cricket Media. 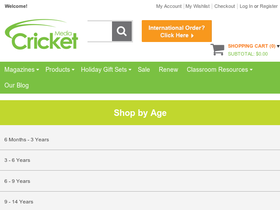 Use this coupon code online at Cricket Media and save 10% off catalog items. Shop for the Holidays online at Cricket Media. Sign up with Cricket Media and enjoy 35% off your first subscription. Save 30% on your Cricket Media costume purchase with this coupon code!